This summary of product characteristics (SPC) is specific to the European Union. 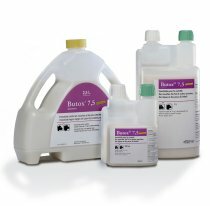 Please note that Butox®7.5 pour on may not be licensed for use in your country or the product's data sheet may be different depending on local regulations. For more information please contact your local MSD Animal Health representative. Aqueous suspension for external use (ready to use pour-on). For the control of ectoparasitic infestations in cattle and sheep caused by ticks, lice, flies and keds. Some organo-phosphorous insecticides can reduce metabolism rate and thus enhance deltamethrin toxicity. Therefore, it is not advisable to proceed with such combinations. Flies: a single application provides protection against flies for 8 to 10 weeks depending on the infestation degree, fly species and weather conditions. Treatment should he repeated within 8 to 10 weeks depending on the weather and the fly species. Lice: a single application is usually sufficient. All in contact animals must he treated at the same time. Sheep should be treated after shearing. Ticks: a single application provides protection against ticks for 4-5 weeks. Overdoses of three times the recommended dose as well as a treatment for an extended period (3 days) did not induce any adverse effects in cattle and sheep. Butox 7.5 Pour On is an ectoparasiticide whose active ingredient deltamethrin belongs to the synthetic pyrethroids class. Its mode of action affects the neurotransmission in the target parasite. After dermal application, deltamethrin is slightly absorbed through skin of cattle and sheep and remains available to the target ectoparasite. The main route of excretion of the absorbed amount in the target animal is the faeces. In terms of residues, fat is the target issue. Keep out of the reach of children, away from food, drink and animal feeding stuffs. Any unused product or waste material should be disposed of in accordance with the national requirements. Dangerous to aquatic life. Do not contaminate ponds, waterways or ditches with the product or used containers.